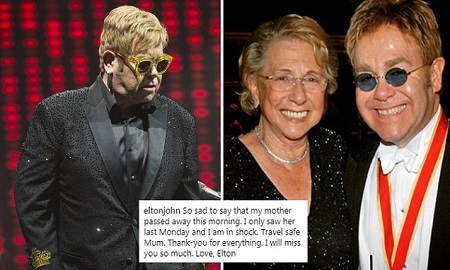 Sir Elton John is in 'shock' today after he revealed his beloved mother Sheila has passed away aged 92 - months after they healed their long and painful rift. The star, 70, had been estranged from Mrs Farebrother for around nine years until May this year following rows over mutual friends and his husband David Furnish. Today he posted a photograph of them together in happier times and wrote on Instagram: 'So sad to say that my mother passed away this morning. I only saw her last Monday and I am in shock. Travel safe Mum. Thank-you for everything. I will miss you so much. Love, Elton'.